Scholastic / Career Ambition: Pursue a double major in college for Music Theater and classical vocal performance. After college, tour America while performing. Scholastic Honors: Member of Gifted and Talented Programs: President’s Outstanding Academic Achievement Award; Superintendent’s, Principal’s, and Scholarships Honor Rolls; National Junior Honor Society Member; recognized as a Duke University Talent Identification Program Student. Leadership Roles: Director of St. Anthony/St. Rose Children’s Choir; Captain of H.S. dance team; Soprano section leader of H.S. Concert Choir and Madrigals; Song leader at St. Anthony/St. Rose Catholic Church. Accomplishments: Accepted to KMEA Honor Choir; Judged “1” for classical vocal performances five years running by Pioneer League Music Festival; accepted for many various roles in professional theatre; Page for Rep. Bill McCreary; Successfully directed a high school play for Wellington Food Bank; Outstanding Choir Member, 3 years. Employement: Hostess at the Crown Uptown Dinner Theater; paid performance roles at the Crown Uptown; paid cantor for weddings and funerals. Special Training: Trained in dance, voice and theatre. 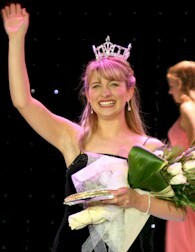 Legacy: As Miss Teen Kansas, Lauren’s greatest goal is to bring communities together for a common purpose. So many relationships are divided where we need them to be strong and supportive, whether it is between teens and their parents or political views within the town. She will promote platform, the awareness of and coping with Alzheimer’s disease and dementia. Interesting Facts: Lauren adores being on stage! She is a die hard shoe and bag collector.